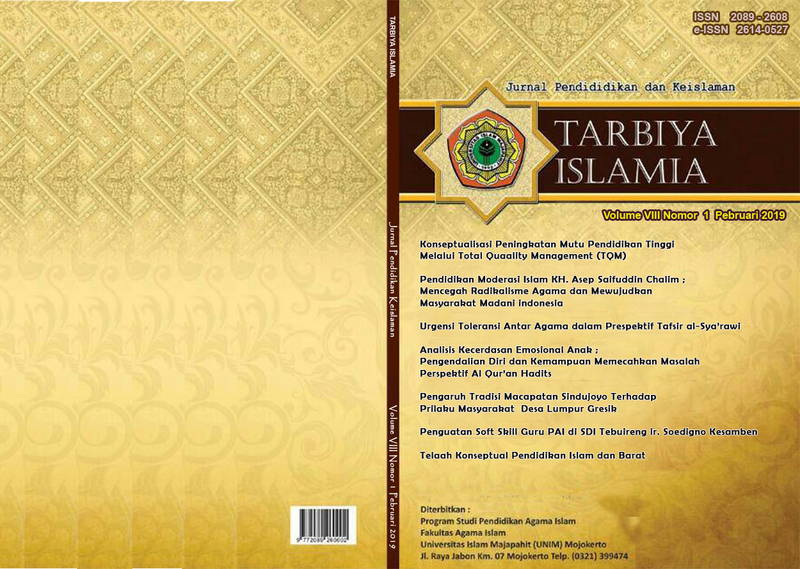 Tarbiya Islamia : Jurnal Pendidikan dan Keislaman is a journal that is published twice a year in the months of February and August. This journal has been indexed on Google Scholar. The aim of this journal is to promote a principled approach to research Islamic Education-related concerns by encouraging enquiry into relationship between theoretical and practical studies. Tarbiya Islamia : Jurnal Pendidikan dan Keislaman invites contributors to publish the research-based articles in Tarbiya Islamia : Jurnal Pendidikan dan Keislaman, a Journal of Education for Islamic Studies Department, Islamic University of Majapahit (Universitas Islam Majapahit) Mojokerto, Indonesia, with ISSN: 2089-2608 and E-ISSN In Progress. The manuscript should be at least 6000 words to be considered for reviews and follow the style of Tarbiya Islamia : Jurnal Pendidikan dan Keislaman. Tarbiya Islamia: Jurnal Pendidikan dan Keislaman is licensed under a Creative Commons Attribution-ShareAlike 4.0 International License. Based on a work at http://ejurnal.unim.ac.id/index.php/tarbiya.